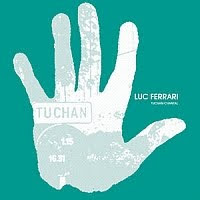 Luc Ferrari's "Tuchan-Chantal" was the reason I came to eMusic in the first place. It was issued by Room40 in 2008 as a digital download so I was forced to seek out an online retailer. The eMusic price of 50 cents sure beats the full album pricing elsewhere! It was subsequently released last year by OHM Editions on disk with a slightly different name, but unless you are fixated on shiny metallic disks, eMusic is the way to go. Luc Ferrari was a French electro-acoustic composer whose output ranged from improvisatory chamber orchestra pieces influenced by jazz and John Cage, to pure phonography of the highest order, to works for solo piano, to rather ordinary musique concrète... and also much in between. I will say more about him at another time, since his work is of some importance to me. Ferrari created a great number of soundtracks and radio plays, what the Germans call hörspiel, and "Tuchan-Chantal" falls into this category. Recorded in 1978, it is largely an interview with a woman, Chantal, from a small village in southwestern France, Tuchan. Ferrari's wife, Brunhild Meyer, takes an active part in the process, as she did with much of his work; it is not too much to say she should be co-credited in this case. I am sure that she was instrumental in getting this work released after Ferrari's death. The fact a thirty-year-old recording has been treated in this way says something, I am sure, of her involvement with it and affinity for it. "Chantal, ou le portrait d'une villageoise", as the piece was originally entitled, was recorded and compiled over some time, from July 1977 to April 1978. It was originally presented as an installation in Tuchan, accompanying a photo essay. You can hear the camera shutter distinctly at points in the recording, along with a church bell, some shuffling from other people in the room, passing traffic, a child and so on. Some cut-up guitar music opens the piece and recur as counterpoint. Sounds from the village filter throughout. All the dialogue is in French and "Tuchan-Chantal" is largely dialogue. This raises an intriguing problem for those unfamiliar with the language. In other Ferrari pieces, the snatches of voice are one thread in a larger fabric. In those cases one might argue that the sound of the words and phrases contribute as much to the final work as their meaning. An indication from the composer that this is so may be found in the inclusion of up to three languages in the same piece. Surely Ferrari is not expecting us to comprehend them all? It could even be said that a speaker of, say, Urdu, would have a richer experience of a piece such as "Hétérozygote", freed from the semantics as they would be. But that argument would be difficult to make in this case. Nonetheless, as someone with only a smattering of French (enough to understand the topics of conversation: art, politics, desire, freedom and so on) I can still say that this work is worth an audition. If nothing else it allows us to partake of the fascinating intimacy established between Luc, Brunhild and Chantal. I believe that realisation of human conviviality, specific subject matter aside, is the real point of "Tuchan-Chantal"; a political statement that, once again, may be more obvious to non-French audiences. "Tuchan-Chantal" is a fascinating work of great delicacy and restraint. Just don't expect a composition, or music in the usual sense!